Last year I started a new tradition that ended up being a huge hit. This year I'm doing it even bigger and better. It's the Cricket Crunch Club! 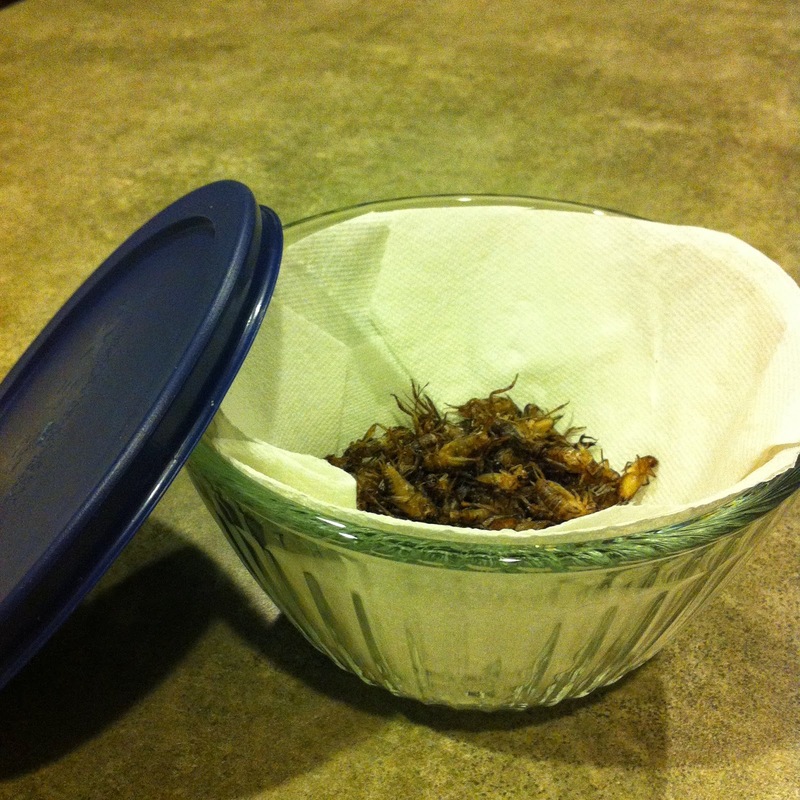 After attending the NSTA Conference and getting my first taste of crickets, I was hooked and so excited to try out the recipe with my students. And I should begin by saying that most of my students would classify me as a diva, girly girl - - so if I can cook and eat crickets, just about anyone can. If you can put aside that you're putting a bug in your mouth, you'll see that they actually taste pretty good. All but one person was pleasantly surprised with their taste last year. To make it special I took a picture of each student who was willing to take the challenge, posing with their cricket right before they ate it (either alone or in a group). The kids love coming up with creative poses - linking arms like married couples do with the cake tasting, balancing them on the tip of their tongue, etc... I printed all of the pictures and glued them on the Cricket Crunch Club poster-board. It is proudly displayed in my classroom and my current 8th graders have been eagerly awaiting their opportunity to join the club. And now the time has come...I'm so excited. During my conference, I walk around campus trying to find a teacher who is willing to join the club and have their picture added to the poster. The principal, vice-principal and office staff joined the club. I even had a few blogging buddies join the club. Check out Miss Klohn's blog post from last year. If you're interested in trying this out with your classes, here's a step-by-step guide! First, purchase enough crickets. I've heard that American Cricket Ranch has great quality, but I get mine locally. I always get extra in case a lot of staff members want to join. You want the crickets to be full grown - the bigger the better! :) Also, freshness is very important, so get them immediately before you are ready to cook them. Next, you will put the crickets in the refrigerator or freezer. This slows them down and keeps them from hopping all over the pace. Usually 10 minutes in the freezer or 15-20 minutes in the refrigerator is sufficient. While they are cooling off, get a pot of water on the stove and bring it to a boil. You also need to pre-heat the oven to 200. The crickets I get usually come with some "bedding" and a potato piece, so I need to separate out all of that junk so that I only have crickets left. I've found that the best way to do this is with a strainer that has larger holes (but not so large that the crickets fall through them). I sift them over the grass in my yard. If there are any obviously dead ones I pull them out at this time. The next step kills the crickets and serves to sterilize them (muy importante!) You can rinse them while they are in the strainer or just toss them directly into the pot of boiling water, like I do. Boil the crickets for 1 minute. Quickly remove them and dry them on a paper towel. Place the crickets on a baking pan lined with foil and spray with oil to prevent sticking. Lightly drizzle some olive oil on the crickets and then season with garlic salt. Bake the crickets for about 1 hour at 200 degrees. If they aren't crispy after an hour, remove them, shake the pan to turn them on the pan, raise the oven temperature to 325 and return the crickets to the oven. Bake at this temperature checking for crispiness in 5 minute intervals. This year, I ended up baking mine at 325 for 15-20 minutes until I reached the desired crispiness. Let them cool, then spread them out gently on a paper towel to absorb excess oil. I take them to school in a small bowl lined with paper towels (to keep them from breaking and to continue absorbing oil). They are delicious! I think they taste like toasted sunflower seeds. If you're looking for some ways to tie it into literature for children, try this book: Freaky Foods From Around the World. In this bilingual story, Lucas' class is invited to lunch. Abuela prepares recipes she encountered in her world travels. The menu has cow's tongue, crickets, snails... The children learn to respect other cultures and expand their tastes! Natural History information on animals used throughout the book and savory recipes are included, as well. So sad I missed this fun day this year!!! It was so fun last year! Cool Activity! Thanks for sharing! I used to make chocolate chirpy chip cookies and mealworm muffins for my students. they loved it!